Ho, ho, ho! Merry Christmas! I heard that you are curious about my reindeer. I'd be happy to tell you more about my team. They have been with me for many years, and I am so proud of them: Dasher, Dancer, Prancer, Vixen, Comet, Cupid, Donner, and Blitzen. And, of course, there's Rudolph who leads them all. His nose seems to light up the whole sky! 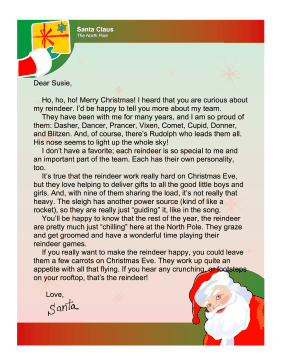 I don't have a favorite; each reindeer is so special to me and an important part of the team. Each has their own personality, too. It's true that the reindeer work really hard on Christmas Eve, but they love helping to deliver gifts to all the good little boys and girls. And, with nine of them sharing the load, it's not really that heavy. The sleigh has another power source (kind of like a rocket), so they are really just "guiding" it, like in the song. You'll be happy to know that the rest of the year, the reindeer are pretty much just "chilling" here at the North Pole. They graze and get groomed and have a wonderful time playing their reindeer games. If you really want to make the reindeer happy, you could leave them a few carrots on Christmas Eve. They work up quite an appetite with all that flying. If you hear any crunching, or footsteps on your rooftop, that's the reindeer!